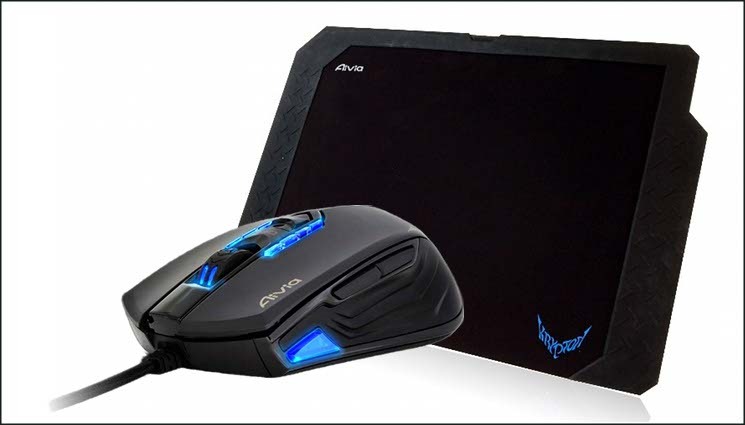 Hot on the heels of our review of the new Osmium mechanical keyboard we present to you the GIGABYTE Aivia Krypton Gaming Mouse and Krypton Dual-sided Mousemat. Designed very much for gamers, and utilising the same GHOST macro software as the Osmium mechanical keyboard, the Krypton changes up surfaces to extend choice for gamers compared to their previous market offerings. The budget to mid-range sections of the market have up till now been amply served by the FORCE range of mice, most recently encompassing the FORCE M7 Thor, and until now the Aivia range has has been this sort of design, only more so. The Aivia Krypton is the latest of these gaming mice with few compromises from GIGABYTE, and is placed at a higher price point than their other wired options. Gaming profiles and user-adjustable DPI settings are something of the norm amongst mice in this price bracket, but in an exceptionally rare twist the ability to swap the mouse casters for a different speed of movement has been added. Combined with 8200DPI sensor and customisable weight package, the Krypton should be a formidable gamer peripheral. The Aivia Krypton gaming mouse features a revolutionary new dual mouse chassis design which allows for a hot-swappable mouse chassis giving the user unparalleled freedom by changing fundamental mouse movement and dynamics to best fit the application at hand. Aivia Krypton further enables maximum control and flexibility by giving users the option to customize the center of gravity and weight of the mouse. GHOST Macro engine with built-in 32KB memory for onboard Macro memorization and gaming on the go. To complement the evocatively named 'dual-chassis' feature, GIGABYTE are also offering the Krypton dual-sided mousemat. This gaming mousing surface is composed of a low friction hard PVC side - ideal for ceramic casters - and precise fabric side - more appropriate for common teflon casters - held in a rubber frame. Users can then choose their favourite combination, whilst still gaining value if they change their mouse at a later date. Although not quite occupying quite the premium label of the Osmium in terms of pricing, marketing to date certainly indicates that GIGABYTE are targeting discerning gamers with these two products. It must be said however, this is a very tough market.